We think our Review Club members are TE-riffic, and we appreciate their honesty when they come across some bad copycats. See what missed the mark. Brandefy compares store brands (e.g., up&up) to name brands (e.g., Dove) to show you when the generic is as good as the name brand, and to warn you when it is not. Our mission is to help you save time and money, and to have a good time while doing it. We had two reviewers test generic versions of Dove go fresh with cucumber and green tea. One reviewed it against Target's up&up version. She said that consistency and feel were the same, but the store brand body wash smelled like chemicals. We do not appreciate bad smelling body wash. Additionally, the ingredient panels were only 75% similar. Thus, we gave the up&up version of Dove body wash an 80% similarity rating. The major issue with the up&up version is the chemical-like smell- yuck! Another tester tested the same Dove go fresh body wash against the equate version. Equate scored a low 65% similarity rating. The ingredient panels are 65% similar, and our reviewer said the store brand wash was much thinner and not as silky as the name brand. She said the after-feel was also very different, and she felt more refreshed after using the Dove. The equate version of the Dove soap earned a 65% similarity score. Perhaps one of the measliest scores we have given out has been for the CVS version of Olay Total Effects Night-Firming Cream. We gave it a rating of 45%. The CVS cream was sticky, and our reviewer could still feel a layer of product on her face when she woke up in the morning. Both creams have a lot of ingredients, but the CVS cream has 27 MORE ingredients than Olay. We would certainly NOT make the switch on this one. The CVS version has one of the worst ratings we have seen across multiple categories. 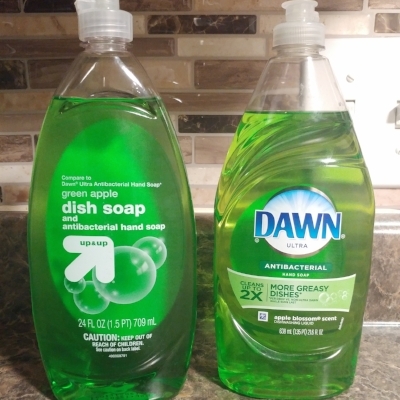 We were excited to see another cleaning product come in, but the Target version of Dawn apple blossom dish soap fell short. Not only did the name brand smell better, it also was much more effective at cutting through tough grease. We gave it a score of 67%. When we are cleaning, we do not want to put in extra elbow grease to get rid of the real grease! The reviewer felt that up&up did not do the job cutting through the tough grease. These products may be duds, but we still think our Review Club members are STUDS. Thanks again, everyone!